ADHD In Childhood May Feed Obesity In Adults : Shots - Health News People diagnosed with ADHD as children may be more apt to be obese in adulthood, scientists say. Differences in brain biology or the impulsiveness typical of ADHD may contribute to lasting, bad eating habits. Does ADHD affect eating and weight? "It makes sense, because they're self-medicating with carbohydrates," says Dr. Edward Hallowell, a psychiatrist in Sudbury, Mass., who has ADHD and treats adults with ADHD. "Carbs do the same thing that stimulant medications do — promote dopamine," says Hallowell, who wasn't involved in the latest study. "So you get the gallon of ice cream at midnight." Attention deficit-hyperactivity disorder may affect up to 11 percent of American children, the majority of them boys. Earlier studies had suggested that adults with ADHD may be more likely to gain weight. That research doesn't prove that the ADHD is causing the weight gain. And this new study doesn't prove that, either. But it does provide better evidence for a potential link because it followed the same group of people over time. It looked at a group of 111 boys with ADHD at age 8. Then their weight was assessed at age 41. The men with ADHD were then compared to similar men who didn't have ADHD as children. The men who had had ADHD weighed an average of 213 pounds, and 41 percent of them were obese. By contrast, the men who hadn't had ADHD weighed 194 pounds on average, and 22 percent were obese. The study leaders realized that weight was becoming an an issue for their participants when some who came in for MRI scans were too fat to fit in the machine. "In most studies you eliminate those people," says F. Xavier Castellanos, a psychiatrist at the Child Study Center at NYU Langone Medical Center in New York and a co-author of the study, which was published in the journal Pediatrics. Instead, the researchers started collecting information on the participants' weight and body mass, or BMI. This study doesn't figure out why boyhood ADHD might be causing weight problems in adulthood. The weight gain could be caused by psychological factors or neurobiology, Castellanos speculates. Differences in the pathways for dopamine, a neurotransmitter in the brain, have been found in both people who are obese and people with ADHD, he says. Or it could be that the impulsiveness typical of ADHD makes it harder for people to say no to food. Children who take stimulant medications like Ritalin typically don't have problems with weight gain because the medications suppress appetite. But eating issues may emerge later. 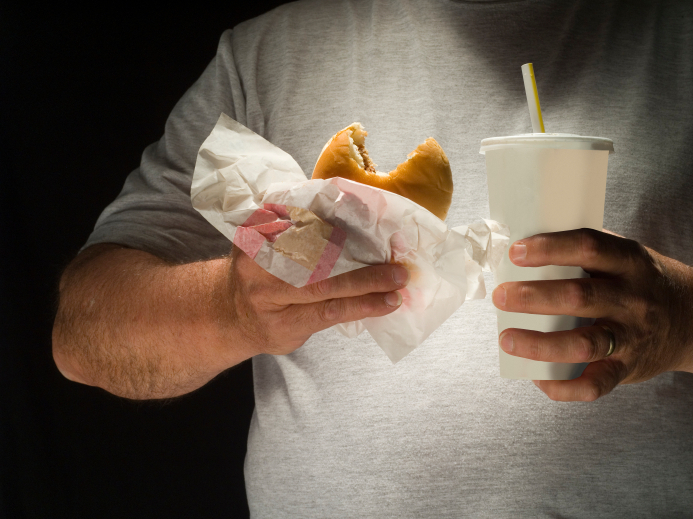 Hallowell says he often sees adult patients with ADHD who struggle with overeating. "Nutrition should be part of the treatment plan," he says. Parents of children with ADHD should take particular care to make sure their children develop lifelong good eating habits, Castellanos says. "The reality is that ADHD people can be at risk for being swayed by temptation."